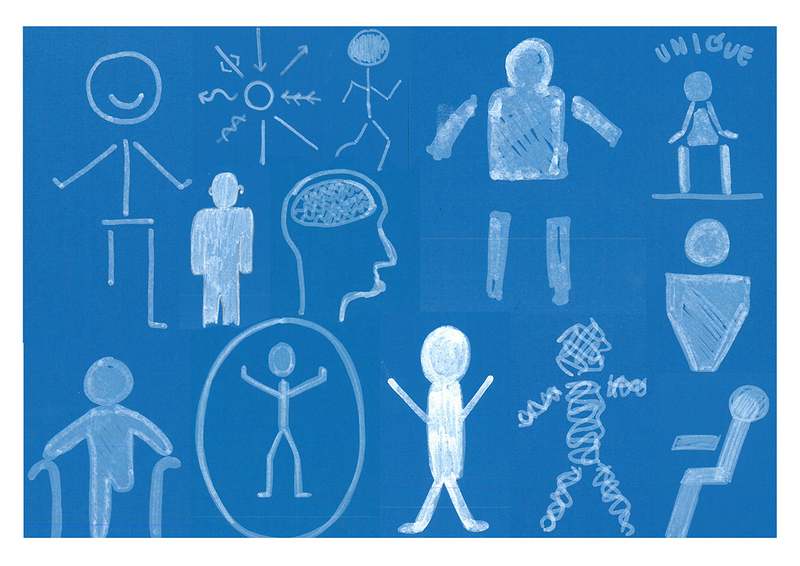 I began exploring invisible disability for a self initiated brief which then lead on to creating material to help children aged 7-11 understand the diagnosis of multiple sclerosis. The aim was to illustrate the often invisible illness and answer their questions. Below are different research techniques which lead me to this point. Drawing Disability - I asked participants to draw the disabled logo without involving a wheelchair. Outcomes involved missing legs, unattached body parts and a sad face. Whilst fewer participants noticed that not all disabilities are visible, with some outcomes depicting an able bodied person. This clearly shows that education is needed, and the barrier between able and disabled needs to be broken. I am able, I am unable - To easily grasp the language of disabled and being unable I asked people to brain storm what they are able to do and not able to do. This simply shows that everyone is unable to do something and the negative language is not necessary. Showing the importance of appreciating that nobody can do everything. MS Photo Journal - The aim was to understand how sufferers of an invisible illness cope, and allowing others to view what can’t be seen on the surface. I organised a photo journal showing a day in the life of a multiple sclerosis sufferer. The photos depict an able bodied person holding down a full time job but the captions reveal the pain and struggle that no one is aware of. What is Multiple Sclerosis? - To understand others knowledge of MS, I asked people to define the illness without researching it. Few people were able to give a correct definition, with many saying they had heard of it. Some got MS confused with motor neurone disease and cystic fibrosis which clearly shows more education is needed. Diagnosis Journals - I asked my mother and two sisters to each answer a selection of questions about how they coped with the diagnosis of multiple sclerosis.